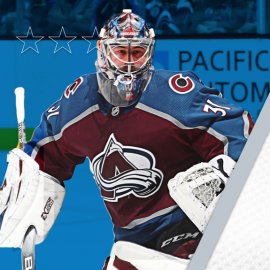 Colorado Avalanche goaltender Philipp Grubauer was named the NHL’s Third Star for the week ending on March 24, the league announced on Monday. Grubauer was in net for each of Colorado’s four games this past week and led his squad to a 3-0-1 mark against Central Division rivals. He made a league-high 149 saves this week with a 1.49 goals-against average and .961 save percentage. The netminder only allowed one goal in each of the first two games of the week, stopping 36 shots in the Avalanche’s 3-1 win at the Minnesota Wild on Tuesday and making 44 saves in a 3-1 victory at the Dallas Stars on Thursday. Grubauer’s 44-save performance at American Airlines Center, which included 23 saves in the third period, was a career-high for the 27-year-old. From Tuesday to Thursday, the goaltender posted the third-longest shutout streak of his career, not allowing a goal for 93:07. He also played in back-to-back games as part of Colorado’s home-and-home set with the Chicago Blackhawks on Saturday and Sunday. Grubauer turned aside 29 shots in the Avalanche’s 4-2 win over the Hawks at Pepsi Center on Saturday, and he made 40 saves in his fifth consecutive start on Sunday in Colorado’s 2-1 overtime loss in Chicago. His win on Saturday was his 15th of the season, matching his career high set during the 2017-18 campaign with the Washington Capitals. The Rosenheim, Germany, native is 6-2-1 in his last 10 appearances (nine starts) with a 1.10 goals-against average, .966 save percentage and three shutouts. He’s helped the Avs pick up points in five straight (4-0-1) and seven of the last eight games (6-1-1). This is Grubauer’s first time being named to the NHL’s weekly stars. He is the fourth Colorado player to be honored in the league’s accolades this season: Gabriel Landeskog earned first star honors for the week of Oct. 15-21, Mikko Rantanen was the third star for the week of Oct. 22-28 and Semyon Varlamov was the first star for the week of Feb. 18-24. Winnipeg Jets forward Kyle Connor was named the league’s first star of the week while Tampa Bay Lightning center Steven Stamkos earned second star honors.